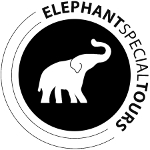 The programm of Elephant Special Tours includes various tours, which orientate on your aim of getting close to the animals and to enable them to have a balanced and calm life. To assure this, we have included daily activities, where you can – depending on the tour – ride the elephant or simply walk with them through the valleys of Northern Thailand. Riding elephants is often critizised in the European media. The argumentation leads from too much stress to the lack of resting breaks. In fact, riding activities, that like to serve as many customers as possible in the shortest time possible, are not good for the animals. Permanent loads and a routine of taking the same routes every day can damage the movements of the elephants in a sensitive way. But if the riding is individually done – with only one guest per elephant, with sufficient resting breaks and with different routes through the forests of Northern Thailand where the elephants can find and chose their own food – then this means security for the health of the animals. It is no problem if a human sits on an animal that weighs up to 4 tons and has enourmous forces. But there must be a calm and prudent approach, with focuses the well-being of the animals. For the guests, who like to get close to the animals but don´t like to focus on riding during their visit, we recommend our 2-Day-Elephant-Bonding-Tour. Here, too, care is taken that the pachyderms feed on the way sufficiently.